The passengers were received at more than ten airports across the country. A federal court in Brooklyn granted an emergency stay Saturday night on President Trump's executive order that bans immigration from seven predominantly Muslim countries for two Iraqi men who had valid visas to enter the United States but were detained Saturday when they arrived in New York. Trump's order calls for an immediate suspension of immigration from countries with ties to terror, including Syria, Yemen, Sudan, Somalia, Iraq, Iran and Libya, for a time period of 90 days. It also calls for the complete suspension of Syrian refugees for an indefinite period. 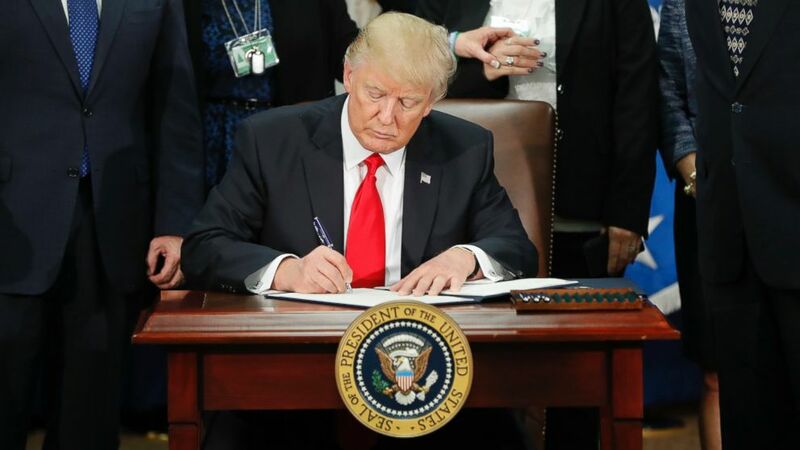 Following the court's decision, the Department of Homeland Security said in a press release that it "will continue to enforce all of the president’s Executive Orders in a manner that ensures the safety and security of the American people. The president’s Executive Orders remain in place—prohibited travel will remain prohibited, and the U.S. government retains its right to revoke visas at any time if required for national security or public safety." It added, "The Department of Homeland Security will faithfully execute the immigration laws, and we will treat all of those we encounter humanely and with professionalism." The ACLU, which had filed the challenge on behalf of the two men, contended that the stay applied nationally to all cases, but that was not clear from the ruling. ABC News was attempting to clarify whether that was the case. The ruling does not appear to overturn administration policy, but does appear to apply to all of those people currently detained at airports across the country who were facing imminent deportation. The judge asked repeated questions of the federal prosecutors charged with defending the executive order, but they were unable to provide numbers of people who were facing the prospect of returning to a country where there lives would be in danger. 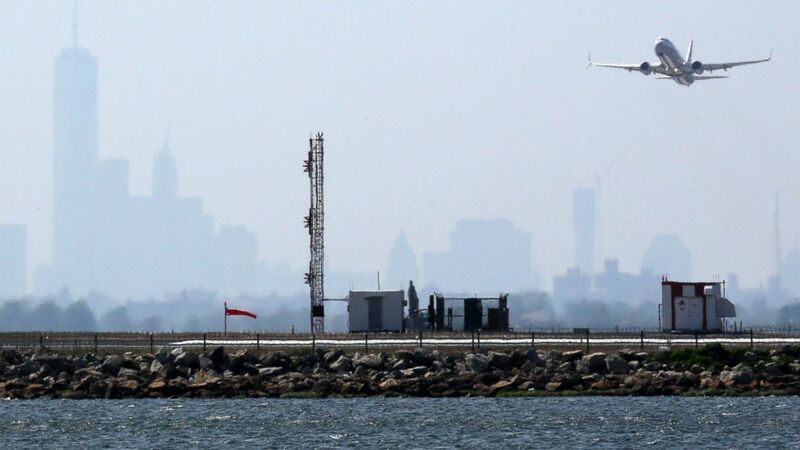 (Trevor Collens/AFP/Getty Images) An aircraft takes off from New York's John F. Kennedy Airport against a hazy backdrop of the New York skyline, May 25, 2015. The order came as protests spread to airports across the country, after passengers were detained or sent home from at least 10 different airports -- according to officials from the airports -- and hundreds of people around the world were barred from boarding U.S.-bound flights. A senior Department of Homeland Security official provided the following figures late Saturday night: 375 travelers have been impacted in one way or another by the executive order. Of those 375 travelers, 109 were in transit to the U.S. and denied entry, 173 were denied entry to the U.S. prior to boarding their flights in a foreign port, and 81 were granted waivers because of their legal permanent resident or special immigrant visa status. Officials anticipate a smaller number of travelers will be impacted Sunday, now that the policy is in full effect. Chicago O'Hare International Airport (13 passengers, per ABC affiliate WLS), Dallas/Fort Worth International Airport (9 passengers), Philadelphia International Airport (6 passengers), Washington Dulles International Airport (exact figure unknown, but at least 3), Los Angeles International Airport (at least 7 people), Atlanta Hartsfield-Jackson International Airport (11 people), Boston's Logan International Airport (2 people), Seattle–Tacoma International Airport (2 people), Denver International Airport (4 people), and San Francisco International Airport (at least 3 people, according to protest organizers). Hundreds of people turned out at John F. Kennedy International Airport to protest the president's order, chanting "No hate, no fear, refugees are welcome here. No hate, no fear, Muslims are welcome here." In New York, the protesters received statements of support from local politicians, including Gov. Andrew Cuomo and Sen. Chuck Schumer. (Pablo Martinez Monsivais/AP) President Donald Trump signs an executive order for border security and immigration enforcement improvements at the Department of Homeland Security in Washington, Jan. 25, 2017. Hundreds also gathered outside the Brooklyn federal courthouse where the emergency hearing was called on the ACLU's legal challenge brought on behalf of the two Iraqi men who were detained at JFK Airport this morning. The two men were targeted for their assistance or connections to the U.S. military and were approved for resettlement in the United States. Two Iraqis who were detained Saturday at John F. Kennedy International Airport in New York City were released later in the day, according to officials. Four other detainees were released early Sunday morning. As of 6 a.m. Sunday, six refugees were still being held at the airport, according to the International Refugee Assistance Project. One of the Iraqis detained at JFK, Hameed Jhalid Darweesh, was released early today and left with New York Reps. Nydia Velazquez and Jerry Nadler, who joined more than 100 protesters that assembled there. The other, Haider Sameer Abdulkhaleq, was released Saturday evening, shortly before the order from the federal court for the Eastern District of New York. Darweesh expressed his gratitude for those who supported him while he was detained. "America is the land of freedom," Darweesh said. "The land of freedom, the land of the rights. This is what brought me to come here, and I'm very thankful." Neither Darweesh nor Abdulkhaleq are technically refugees according to the definition in the president's executive order but appear to have come to the U.S. on visas, a Trump administration official tells ABC News. In Seattle, members of Congress from Washington state, Washington Governor Jay Inslee, and Seattle Mayor Ed Murray all spoke out against the executive order. The executive order contains a caveat that allows certain individuals to be admitted to the country if there is a national security interest in doing so, and these two may be eligible for such an exemption, which must be agreed upon by the State and Homeland Security Departments, but the process by which this happens is unclear. One of the individuals detained at O'Hare International Airport in Chicago Saturday was expected to return to Saudi Arabia, according to the Council on American Islamic Relations (CAIR). Sahar Alghnimi, a Syrian woman who came to the U.S. on tourist visa to see her mother who had just undergone cancer surgery, was detained when she arrived from Saudi Arabia at 8:48 a.m. on Eithad Airlines, CAIR Chicago executive director Ahmed Rehab told ABC News. Alghnimi had been to the U.S. several times before and has a valid visa, Rehab said. In Philadelphia, two Syrian families were detained. Mayor Jim Kenney issued a statement on Trump's executive order, suggesting that the detentions were carried out by U.S. Customs and Border Patrol. In Dallas, nine people have been detained, according to a media representative of CAIR. Ripple effects from the executive order are also being felt in multinational technology companies. Google CEO Sundar Pichai circulated a staff memo, obtained by Bloomberg News, in which he criticized Trump's action and suggested that some of the firm's employees and their families could be affected by it. Likewise, several colleges advised foreign students and scholars who might be affected by Trump's order to defer travel outside of the U.S. at least until there is more clarity on how the order may affect them. Trump categorized the executive order as part of a vetting plan to prevent "radical Islamic terrorists" from reaching American soil. The seven-page document calls for an immediate suspension of immigration from countries with ties to terror -- Syria, Yemen, Sudan, Somalia, Iraq, Iran and Libya -- for a time period of 90 days. But none of the countries on the list have had anything to do with terror incidents on U.S. soil since the 9/11 attacks, and Saudi Arabia -- where 15 of the 9/11 hijackers were from -- is not included. It also calls for the complete suspension of Syrian refugees for an indefinite period. It also calls on the secretary of state to suspend the entire U.S program for admitting refugees for 120 days while authorities review the application and adjudication process. Green card holders, who are legal residents of the United States, also fall under Trump's executive order on immigration if they come from any of the seven Muslim-dominated countries from which immigration is temporarily banned, according to a senior administration official who spoke to ABC News. Trump told the the Christian Broadcasting Network that Christian refugees would be given priority over Muslims in applications to come to the U.S.
"We are going to help them," Trump said of Christians in Syria. ABC News' Benjamin Stein, David Caplan, Matt Foster, Aaron Katersky and Jack Date contributed to this report.